Each year, Flag Day is celebrated on June 14. This day was chosen because the American flag was first adopted June 14, 1777. June 14 is also the anniversary of the U.S. Army’s creation. In the almost 240 years since the flag was adopted, a lot of myths have risen out of its history. There are also quite a few misconceptions about the Flag Code, which explains how to properly fly and care for the flag until it’s retired. Here are 10 popular myths you may have been told about the American Flag. Myth 1: The 50-star flag was designed by government officials. The iconic 50-star may seem like it was put together by a government committee after Alaska and Hawaii both became states in 1959. However, it was actually designed by high schooler Robert G. Heft as part of a school project. His teacher thought it lacked originality and only gave him a B-minus. Luckily, the teacher reconsidered after the design was accepted by the U.S. Congress. Myth 2: You can only fly a current flag that shows all 50 stars. According to the U.S. Army Institute of Heraldry and the Flag Code, old versions of the flag never become obsolete. As long as a flag is still in good condition, it can be flown regardless of the number or arrangement of its stars. Myth 3: Local government officials can decide when the flag is flown at half-staff. Although mayors and other local government officials often do make the call to fly the flag at half-staff, they’re not supposed to. Only the President or a state’s Governor actually has the authority to order the flag to be half-staffed. Myth 4: The flag must be destroyed after it touches the ground. The flag is never supposed to touch the ground, but it’s a common misconception that you have to destroy any flag that accidentally touches the ground. As long as the flag is still in good condition, it’s more respectful to continue flying it than destroy it for touching the ground. Myth 5: Flags can’t be washed or dry cleaned when they’re dirty. In order to look their best, flags should always be clean. Rather than destroying a dirty flag, the Flag Code actually encourages careful washing or dry cleaning. Myth 6: The flag code no longer requires flags flown at night to be properly lit. At some point, a rumor began that it was okay to fly the flag all day and all night without it being lit or taken down in bad weather. That couldn’t be further from the truth! The American flag should always be properly lit if it’s flown overnight, and it shouldn’t be flown in severe weather unless it’s specifically made to hold up in all weather conditions. Myth 7: It’s illegal to burn the flag. It may seem extreme, but burning the American flag is protected under the First Amendment as a form of free speech. This wasn’t always the case. A Supreme Court ruling in 1989 reversed an earlier law against desecrating the flag. The fact that it’s technically legal to burn the flag doesn’t make it okay in most Americans’ eyes. Myth 8: You can be punished for not following the Flag Code. There are a lot of ways to “break” the Flag Code, oftentimes without meaning to. However, the Flag Code is only a set of guidelines and there is no “flag police” to enforce it. Still, it’s respectful to stick to the code as much as possible. Myth 9: Betsy Ross is solely responsible for making the first American flag. You were probably taught in grade school that Betsy Ross designed and sewed the first American flag that made its debut in 1777. In fact, there are no letters, diary entries, newspaper stories, bills of sale or evidence of any kind that Ross even had a hand in making the first flag. The story didn’t even take on until 100 years later, when a relative of Ross told the Historical Society of Pennsylvania that George Washington sought out Ross to design the flag. Myth 10: It’s patriotic to wear the flag. The Flag Code is adamant that the flag should never be used for advertising purposes, nor should it appear on a costume, clothing, decoration, or temporary items such as napkins. The flag itself should also never be worn as apparel. However, that doesn’t stop companies from using the flag as a design whenever they want. 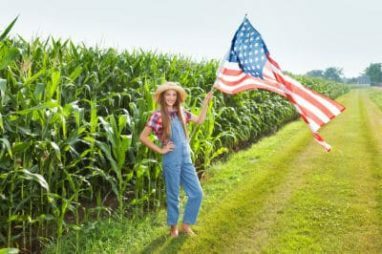 Flag Day is a great time to learn more about American history and how to fly the flag, but there aren’t many traditions beyond that. This Flag Day, start your own tradition by making a difference in the community! A great way to make a positive impact is by donating your car to help local kids. Wheels For Wishes is here to help you do just that. We make it easy to donate online or over the phone at 1-877-431-9474. Your donation supports children’s charities in your community. On top of that, you also receive free towing and a great tax deduction. Start a new tradition for June 14 and donate your car today!